Who says pancakes must be cooked on the stove?! This upside down pancake is prepped in a skillet but finished off in the oven. Add it to your must-have list of quick and easy treats for family or unexpected company. Thinly sliced apples are poached in cinnamon syrup, then topped with a light, airy pancake batter. Once baked, the dessert is inverted onto a plate. It may be sliced and enjoyed immediately or left to cool for later serving. Offer it plainly, or dress it up with a simple garnish of whipped cream, sour cream or vanilla ice cream. Peel, core and thinly slice the apples. In a 10-inch skillet, melt the butter over medium heat. Add the sugar and cinnamon and stir to distribute evenly. Add the sliced apples, cover, and cook for about 5 minutes, or until the apples are tender and a rich syrup has formed. Stir gently once or twice during cooking. Remove the pan from the heat. Push the apples to distribute them evenly over the bottom of the pan. If you like, you can take the time to arrange them in a pattern. In a medium-sized bowl, combine the flour with the sugar, baking powder, and salt. Add the egg yolks and milk, whisking until smooth. With an electric mixer, beat the egg whites to soft peaks. Gently fold the egg whites into the flour mixture, then spread the pancake batter over the cooked apples. Place the pan in the preheated oven and bake for 10 to 15 minutes, or until golden and puffy. Remove the pan from the oven and use a rubber spatula to loosen the pancake from the sides of the pan. Invert a serving plate over the frying pan then carefully hold the pan and plate together and flip them over so that the cake releases onto the plate. Serve warm or at room temperature. For best texture, the pancake is best eaten the same day. Be sure your skillet is oven-proof before proceeding. If you're unsure, plan to bake the dessert in a round cake pan or tart pan instead. The recipe easily adapts to gluten-free, dairy-free and sugar-free versions. It's easy to forget that the skillet has a hot handle once it's been removed from the oven. Slide an oven mitt over the handle as soon as the pancake is done so that you don't accidentally burn yourself when inverting the skillet or moving the pan. The handle will take a while to cool. For an extra fluffy pancake, or if using a 12-inch skillet, make 1 1/2 times the recipe. To make a gluten-free pancake, use gluten-free flour (an all-purpose baking mix is best) and increase the baking powder to 1/2 teaspoon. An additional egg is also helpful. To make the pancake sugar free, use honey in place of sugar when cooking the apples. You can omit the sugar entirely from the pancake batter, or add a pinch of Stevia or another natural sweetener. To make the pancake dairy free, use coconut oil in place of the butter, and coconut milk or almond milk in place of the milk. If you don't have an oven-proof skillet, a regular cake pan or round silicone mold works fine. Just transfer the cooked apples to the pan you'll be using in the oven. 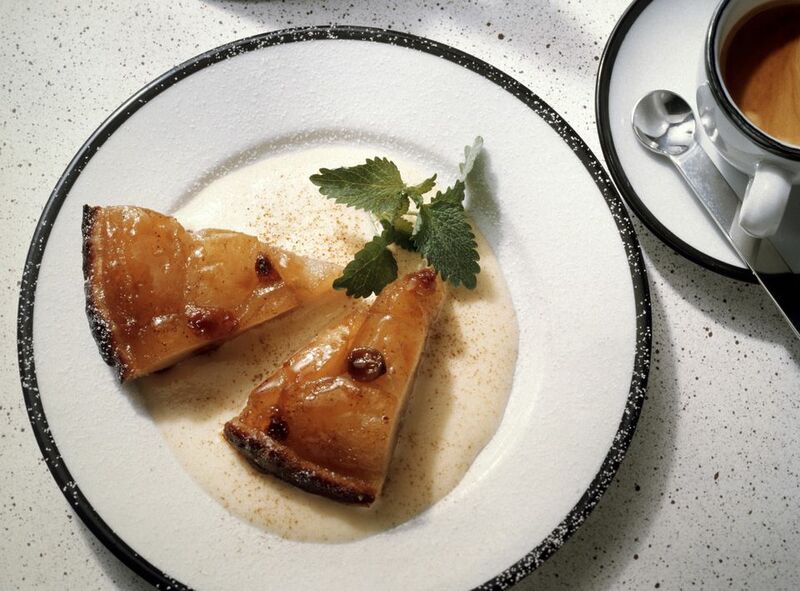 For other apple treats, try these popular Moroccan offerings including the French apple tart with pastry cream and chaussons aux pommes.